Welcome on the Ocf Server (Ocf Embedded + OcfApiServer)’s User Guide. This post will help you to get started Ocf Server, from the installation to use instructions. You can also get the PDF here. 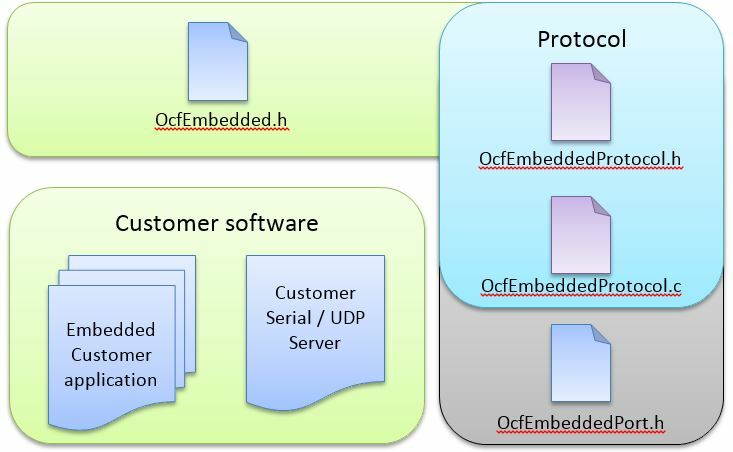 Ocf Server (OcfEmbedded) is necessary to use any Objectis products in order to connect your Client (it can be oStudio – Live Tuning or your own application). You will find bellow the basic informations to set your Server. After connecting the target to oStudio Live Tuning, the live debugger allows browsing of all the dictionary content and to use the variables or functions in watches, traces, etc. The first step is to integrate the four OcfeEmbedded files into a project. Make the protocol compile using the OcfEmbeddedPort file to adjust target specification (optional). Program the Serial or UDP server to establish a link between the server and the client. See oStudio – Live Tuning to discover the full potential of this tool. The OcfEmbeddedPort.h porting file is in most cases ready to use. But if necessary, you can adapt the parameters of OcfEmbedded to suit your needs. With the compilation constant OCFE_MEMORY_AREA you can choose where the OcfEmbedded protocol process data is stored. If you leave it blank, the data is placed to the default memory area. Several features are activated by default. But they can be disabled depending on the needs or capabilities of the processor. To disable a feature, just comment it. Enable float capability for the protocol. It must be activated to publish float variables. Saves a little code memory space when disabled. Enable double capability for the protocol. It must be activated to publish double variables. Enable string capability for the protocol. It must be activated to publish string variables (char array). Saves a little code memory space and a little data memory space when disabled. Enable function invocation for the protocol. It must be activated to publish functions. Enable frame numerator security for the protocol. This activates the frame number copy for the response to the client when it is queried, and thus enhances the robustness of the protocol. Saves a little data memory space when disabled. Saves a little data memory space and significant processing time when disabled. Other parameters are required functions for the protocol process. Normally they are all contained in the standard libraries compilers. But if needed, you can change the functions involved and replace them with your own. Declaration of a dictionary with name dictionaryName. Dictionary must be declared in an area accessible by the function that will publish it. NB. You can use a specific memory area placement with xdata, pdata, __idata etc. keywords if necessary. e.g. Allows the publication of a variable in read/write mode. 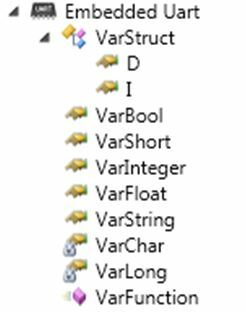 Specify the variable name and the ocfeType (c.f. 6.1.1 Ocfe variables type). NB. The published variable must be accessible where the dictionary is declared. Allows the publication of a variable in read only mode. 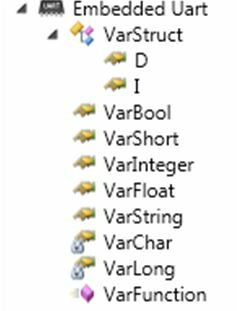 Specify the variable name and the ocfeType (c.f. 6.1.1 Ocfe variables type). Allows the publication of a function with no return value to be invoked by a client (oStudio). Specify the function name. NB. The published function must be accessible where the dictionary is declared. Allows the publication of a function with a return value to be invoked by a client (oStudio). Specify the function name. There are several publishable types of variable. You must precise them in the dictionary declaration. To publish a Boolean representation of a variable. The source variable can be a BOOL or a char variable. To publish a char ASCII character representation of a char variable. To publish a short variable. To publish a int variable. To publish a long variable. To publish a float variable. To publish a double variable. To publish ASCII string representation of a char array variable. Is the type that must be used to declare the context variable for serial communication. When you receive a character by a serial connection, you must pass it to the Ocfe protocol with this function. Is the pointer to the dictionary used. Is the pointer to the StreamContext variable used. A short representation of the amount of characters that are ready to be sent. You can use this value to know if the system is ready to send a response. This function is used to get the next Ocfe character to send. Is the pointer to the current stream context. A short representation of the amount of characters that are ready to be sent. This is an example in polling mode. Simply check the new received character from a serial connection and send it to the Ocf Embedded process. When a character is ready to be sent by the Ocf Embedded process, it will be sent. This is an example in half interrupt mode. When a new character is received from a serial connection it is sent to the Ocf Embedded process. When a character is ready to be sent by the Ocf Embedded process, it will be sent directly from the Rx ISR handle. This is an example in full interrupt mode. When a new character is received from a serial connection, it is sent to the Ocf Embedded process. When a character is ready to be sent by the Ocf Embedded process, it will be sent directly from the Rx ISR handle. But only the first one will result in triggering Tx interrupts. The remaining characters will be sent by the Tx ISR handle. There is only one variable and only one function used for UDP communication. Is the type which must be used to declare the context variable for UDP communication. When you receive a packet from a UDP connection, you must pass it to the Ocfe protocol with this function. Is the pointer to the used dictionary. Is the pointer to the used PacketContext variable. Is the received characters count. A short representation of the number of character that are ready to be sent. This is an example in polling mode. Simply check the new received packets from the UDP connection and send it to the Ocf Embedded process. You have to directly use the buffer of packetContext (packetContext.Buffer) and fill it with the new packet received from the UDP connection. When a response packet is ready to be sent by the Ocf Embedded process, it will be sent.